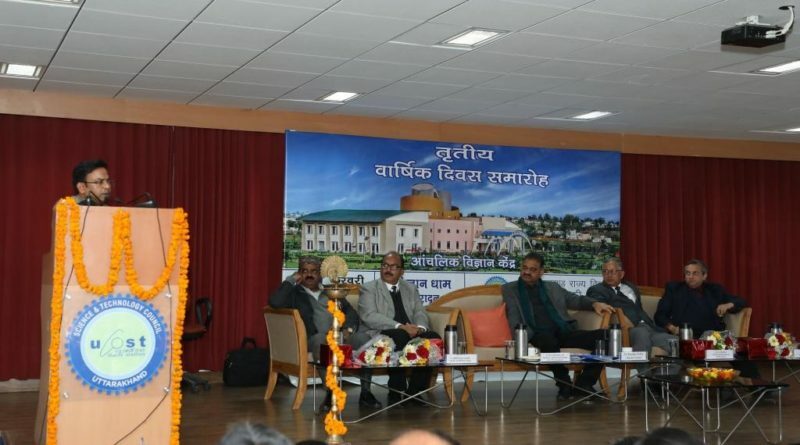 On the auspicious occasion of 3rd anniversary of Regional Science Centre, Vigyan Dham, Dr. Rajendra Dobhal, Director General, UCOST, delivered the welcome address to all the dignitaries and guests and said about the precious value of Regional Science Centre. He also emphasized that students should frequently visit Science Centre which will definitely be helpful in developing their mind in a constructive way. 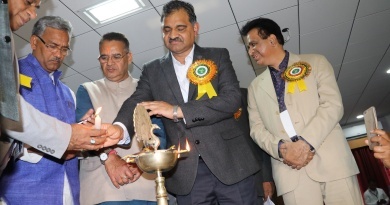 Our Chief Guest, Secretary, Science & Technology, Dr. R.K. Sudhanshu spoke on solid waste management and also mentioned that in Dehradun city, 250 million tonnes waste comes daily. China is the first country with respect to carbon emission. He emphasized that challenges are everywhere but one should be determined and intentions should be high. Dr Anjan Ray, Director, Indian Institute of Petroleum, said that our country import crude oil of 120 million dollars but in the next three years there will not be any requirement of importing fuel from other countries. In our country, biogas purification plant has set up in Pune. 500 million tonnes carbon atoms got waste and we import 350 million tonnes carbon atoms. Thus, by collecting these carbon atoms through waste, we can produce fuel. After collecting plastic, 800 litre diesel can be made. Dr Samrendra Kumar, Director, HQ, NCSM, Kolkata said that there are 44 functional science centres in our country. Orissa, Tripura and Kerela will also get their Science Centres in a short span of time. Work on other 12 Science Centres is also going on. 35 Innovation hubs are functional in our country and their more than 10,000 students are their members. 13 patents have also filed till now by the students. He alos stated that Science Centre is the main medium of exposure to students and emphasized on cross-disciplinary approach i.e. study of two different disciplines. 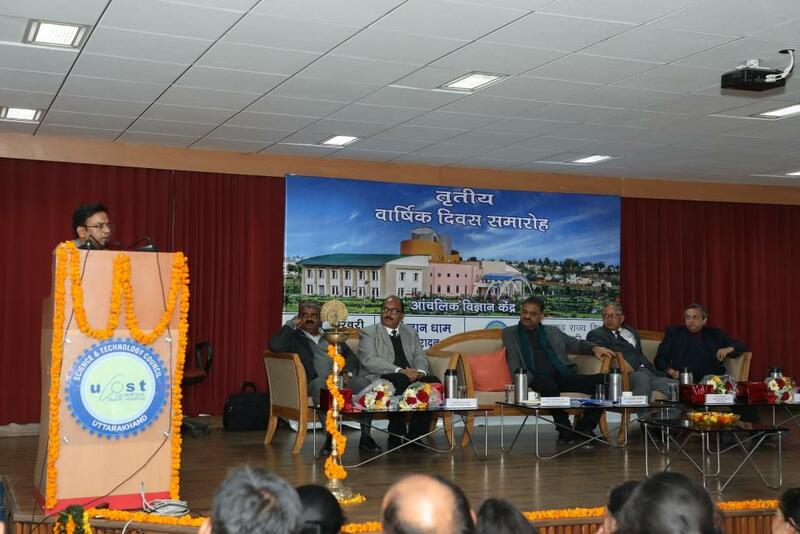 Dr. Sameer Sinha, CEO, CAMPA, Uttarakhand, praised about enthusiasm of students at Vigyan Dham. He said that Science is associated with curiosity. There are lots of inventions which have to be done in the area of science and technology but one should always clear doubts by questioning repetitively in science. He also suggested giving hands on experiments to students. Dr. G.S. 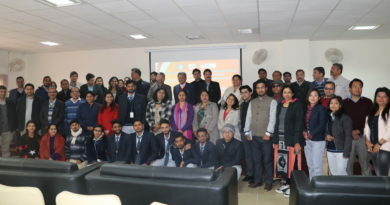 Rautela, President Katyur Foundation and former Director General, NCSM, delivered a lecture on Science Communication and Emerging Issues. He said that Science plays a major role in shaping our view of world around us. He emphasized that Science is experimentation and proven of experiments with verification. He mentioned the use of science in various sectors such as health, telecommunication, agriculture etc. There is a knowledge gap between scientists and normal people, therefore, popularization of science is essentially required. He also showed some interesting hands-on experiments. 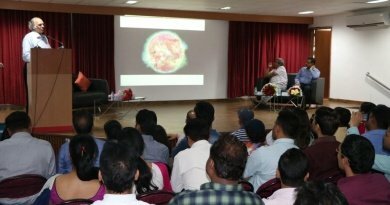 He also said that there is a need of awareness and understanding of scientific issues, developing science and motivation to do so and promotion/advocacy of science itself. He also mentioned the science policies. He said, “Keep Science Simple and make it fun”. He opined the fact that 77% of Indians feel that Science & Technology make their lives healthier and easier as compared to 86% in US. Honorable Chief Minister of Uttarakhand, Shri Trivendra Singh Rawat Inaugurated 3- Day’s OPAI – MIDCON 2017 in Collaboration with UCOST at Vigyan Dham, Dehradun on 24th March, 2017. 24/03/2017 Admin-3 Comments Off on Honorable Chief Minister of Uttarakhand, Shri Trivendra Singh Rawat Inaugurated 3- Day’s OPAI – MIDCON 2017 in Collaboration with UCOST at Vigyan Dham, Dehradun on 24th March, 2017.